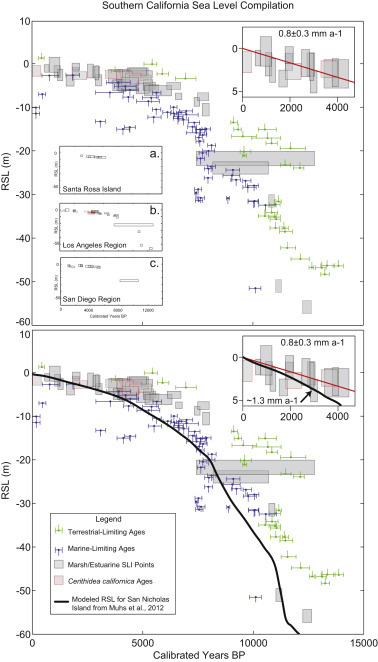 Although sea-level highstands are typically associated with sediment-starved continental shelves, high sea level does not hinder major river floods. Turbidity currents generated by plunging of sediment-laden rivers at the fluvial-marine interface, known as hyperpycnal flows, allow for cross-shelf transport of suspended sand beyond the coastline. Hyperpycnal flows in southern California deposited six subaqueous fans on the shelf of the northern Santa Barbara Channel. Using eight cores and nine grab samples we describe their deposits, age, and stratigraphic architecture. Fan lobes have up to 3 m of relief and are composed of multiple hyperpycnite beds ~5 cm – 40 cm thick. Deposit architecture and geometry suggest the hyperpycnal flows were modified by buoyancy reversal, resulting in well-sorted, structureless, elongate sand lobes. Contrary to conventional sequence stratigraphic models, the presence of these features on the continental shelf suggests that active-margin shelves may locally develop high-quality reservoir sands during sea-level highstands and need not be solely the site of sediment-bypass. These deposits may provide a Quaternary analogue to many well-sorted sandbodies in the rock record interpreted as turbidites but lacking typical Bouma-type features. Contrasts between the density of interstitial fluid within a turbidity current and the density of ambient fluid through which the current is traveling result in changes in the overall morphology of turbidites. This series of flume experiments explores the evolution of turbidity currents with relatively light interstitial fluid and the ways in which buoyancy reversal, or lofting, effects the overall geometry of submarine fans. With colleagues at East Carolina University (Dr. Regina DeWitt), we have developed a new way to date raised beaches in Antarctica. 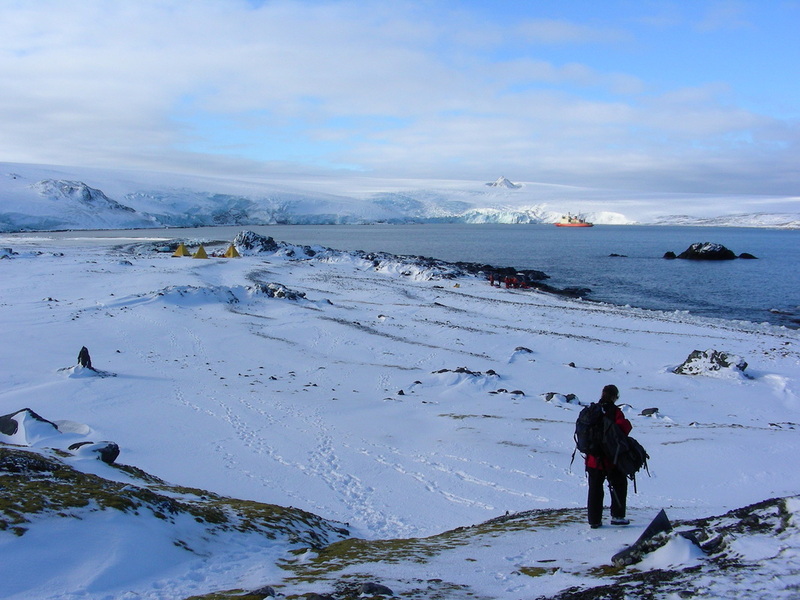 We have used this data to reconstruct past sea levels across the Antarctic Peninsula and provide new insights related to the ice-sheet and climate history of the region. Coastal deposits, including estuaries, provide an ideal archive of past climate and tectonic events. 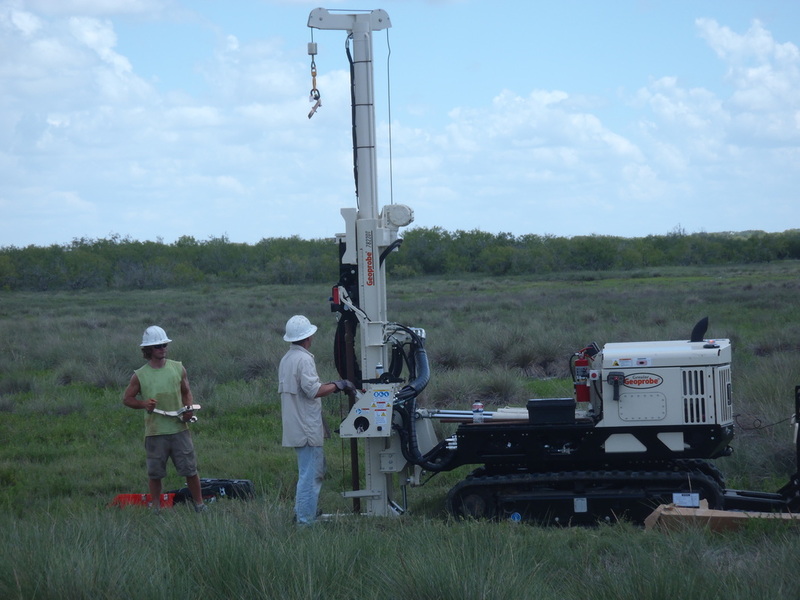 We have taken cores in dozens of shallow water marshes, tidal flats, coastal lakes and bays across the Gulf of Mexico and California. From these deposits we have reconstructed past records of environmental change and extreme events. 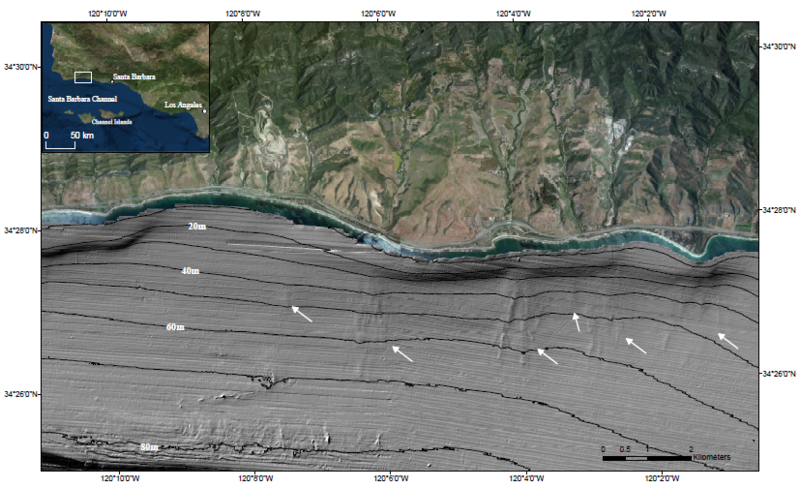 Ground-penetrating radar (GPR) profiles from the Ventura-Oxnard Coastal Plain in southern California provide insight into processes governing the deposition of sediments proximal to wave-dominated deltas. Both wave-dominated deltas and prograding clastic shorelines exhibit similar characteristics, making distinguishing them in outcrops with limited exposure a difficult task. However, one process that may be unique to wave-dominated deltas is the welding of offshore bars that have formed after large floods along the delta, onto the shoreline. This process forms landward dipping sediments that we have imaged in GPR profiles. Cores taken along the GPR profiles will provide sediments that can be dated using optically stimulated luminescence to match these bar-welding events to historical local storms in order to confirm their origin. The ability to identify different depositional environments enhances the understanding of facies architecture and depositional processes occurring along shorelines.